In the energy and environmental news, and of concern to Minnesota residents are the impacts of energy development from the fracking process for securing oil and gas and the mining of sand for use in this process. What many citizens don’t know is that oil pipelines already cross northern Minnesota, and producers are currently requesting increased pressure limits to push more oil through them. Minnesota’s own tar sands pipeline has been online since October 2010, with volume increases in the works larger than the Keystone XL proposed capacity. Enbridge, the largest Canadian oil transport corporation, has a 285-mile tar sands pipeline across northern Minnesota crossing the Mississippi headwaters, also crossing water flowing north to Hudson Bay and east out the Great Lakes/St. Lawrence Seaway. Enbridge requested an increase of 27 percent to 570,000 barrels per day in a pipeline operating since 2010. The majority of this oil is for export. Local Pagan environmental activist Susu Jeffrey has published this article detailing the ongoing health and leakage concerns regarding these pipelines that cross our state and Native American lands. Working with the Friends of Coldwater Spring in Minneapolis they have established a petition to urge President Obama to reject the capacity increase with copies sent to state and local officials. Gary Johnson, Libertarian candidate for President, appeared yesterday at Macalester College, Kagin Commons, in Saint Paul, MN. Organized by Macalester Young Americans for Liberty, there were approximately 200 interested voters attending, a mix of mainly students and “third-party” supporters. In a brief interview with PNC-MN as he left for the airport, Gary Johnson announced he had just learned he was officially excluded from the upcoming Presidential Debates. He stated his campaign already had plans to file lawsuits in at least three states to contest the ruling. Civil suits were reportedly filed late yesterday against both major parties and the Commission on Presidential Debates based on violations of the Sherman Anti-Trust Act, which prohibits monopolistic practices. Opening the afternoon was Murphy’s Midnight Rounders, a local folk pagan band, who were well received by the crowd. They played two songs with “hemp” themes which got a rise from supporters of the Grassroots Party , Libertarians, and other groups who support decriminalization of recreational drugs. Andrew Ojeda, a Macalester undergraduate running for office in district 64A as a Republican, and Ms Yer Lor, a representative from “Minnesotans United for All Families” , both gave opening remarks. Lor implored Minnesotans to defeat the marriage amendment. Several local Pagans are supporters of this group, and the group was active soliciting signatures at Twin Cities Pagan Pride. During the band performance Gary Johnson slipped into the audience front row, to little notice from the sizable media contingent present. Later, as former Governor Jesse Ventura arrived and sat near the PNC-MN contingent, the main stream media all shifted to front stage, to get shots of the colorful former wrestler in his Jimi Hendrix T-shirt. It appeared main stream media saw the story as Ventura’s appearance and implication of a 2016 run for President as the prime story over the visit of an existing candidate, polling 6% nationally at this point, Gary Johnson. Ventura spoke next and praised Johnson’s efforts as a third-party candidate, and for his Libertarian, fiscally conservative but socially liberal, views. He suggested Presidential candidates should be required to wear “NASCAR style suits”, with “patches from all their biggest donors, their biggest bribers” . He said voters should know, “Who owns them, who has bought them off?” Ventura encouraged young Libertarians to fight for a constitutional amendment to remove a corporations ‘personhood”, from having rights of free speech and spending in political campaigns. He said the American political system was threatened as long as unlimited and undisclosed money can flow into political campaigns. He tells people who say a third-party candidate vote is wasted that “a vote for a Democrat or Republican is a wasted vote, because you are going to get the same thing. ” He encouraged the audience to support free speech even if the content it is not popular, because the protection is there to protect unpopular speech. He chided main stream media as being controlled by four major corporations, and no longer a “watch dog'” of the three branches of government. While he personally is not a technology or even a cell phone user, Ventura supported the internet as the last place where the “truth” can get out, saying, “Thank goodness for the internet”. He encouraged Americans to get out and vote, and stressed the importance of voting for Gary Johnson who is paving the road for future candidates. A federal court ruled Tuesday that Flambeau Mining Company (FMC) violated the Clean Water Act on numerous occasions by allowing pollution from its Flambeau Mine site, near Ladysmith, Wis., to enter the Flambeau River and a nearby tributary known as Stream C.
The lawsuit was filed early last year by the Wisconsin Resources Protection Council (WRPC), the Center for Biological Diversity, and Laura Gauger. The complaint charged that Flambeau Mining Company (a subsidiary of Kennecott Minerals Company / Rio Tinto) was violating the Clean Water Act by discharging storm water runoff containing pollutants, including toxic metals like copper and zinc, from a detention basin known as a biofilter. 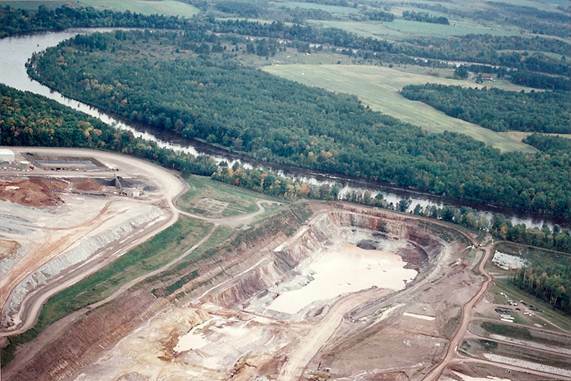 Flambeau Mine in September 1994, when heavy rains caused flooding at the mine site. The federal Clean Water Act makes it unlawful to discharge pollutants from a point source to waters of the United States without a permit issued under the National Pollutant Discharge Elimination System (“NPDES”). Both the U.S. EPA and the DNR (which has been delegated authority to issue NPDES permits in Wisconsin under its parallel program, the WPDES) commonly issue permits to point-source discharges of industrial stormwater such as the discharge from FMC’s biofilter. The most important function of an NPDES permit is to ensure that all applicable water quality standards are maintained. FMC never had an NPDES permit authorizing the discharge of copper, zinc, iron, and other pollutants from the biofilter to Stream C, and therefore was in violation of the Clean Water Act.